Monday - Friday: 8:30 a.m. - 4:30 p.m., except City Holidays, Saturday & Sunday. Payments for additional permits are due at the time they are requested, and BEFORE a permit will be released. NOTICE: Special requests require review and processing time in addition to the 14 day cut off booking period for typical picnic or facility rentals. A lead request time of 4-6 months is strongly suggested. Commonly used for PARK ONLY events. For example, a rental of park spaces that requires park services ONLY. USE FOR: Curfew extensions, holding an event at a typically non-bookable park, or public events with food vending/merchandising (that do not include alcohol sales, structures, or tent permits). For public events at readily available common picnic and facility rental sites, where there is a request for vending, merchandising or similar. www.AustinTexas.gov/CityStage, see the “Event Planning” section. Use for events which require services/permits for a park AND any one of the following: public safety personnel/security personnel, medical support services, lake/open water use, use of sidewalks/streets as part of a run/walk route or similar, fire inspections, tents/ canopies, building structures such as stages or platforms, health permits, public events where alcohol will be served or sold. See the Special Events Section of this page for additional information, peark event periods, and sample items required. Make sure to ONLY look for dates labeled OPEN! COMMON INFORMATION: All picnic site rentals start at $60 per site per day for any period between 10 am and 10 pm at most sites. Bookings start 6 months in advance, or read more here. Payments are due received in the park events office within 14 days of booking to confirm the reservation. Use the "At a Glance" picnic site list below and find a site that matches your needs. Check the online calendar for availability. Map Tip - Red icons show parks at large, green icons show actual site locations reservable within each park. You may switch between "map or satellite" views. Map Tip - NOTE - you may also use the navigate function to map a route to the picnic site! Fiesta Gardens: 2100 Jesse E. Segovia Street - Excellent for small festivals and private events. Mayfield Cottage: 3801 Old Bull Creek Road (Next to Austin Museum of Art) - Historic garden location for small private events. No music allowed at this site. Sparky Park Station Building: 3701 Grooms Street - Perfect for meetings/uses central to this neighborhood. Extremely limited parking. 30 people or less. NO amplifed sound allowed. Zilker Clubhouse: 200 Zilker Clubhouse Road (Off Rollingwood Drive) Perfect for small events of approximately 125 people. The events office will make every effort to review and approve filming uses when an application is received. However, it is more difficult with shorter lead times or at park locations with high public usage such as pools or metropolitan parks. In order to be most successful, thoroughly detailed applications should be received 7 or more days in advance of the requested start date. Shoots with at popular or metropolitan parks, with multiple locations, detailed needs, or large numbers of cast/crew should plan to submit requests 14 days or more in advance of the start date. Park Rules - Glass, Styrofoam and Smoking are prohibited in all parks. Alcohol Sales - $30. For review of alcohol sales requests, and compliance with city regulations for sales on park property. The alcohol sales and consumption requirements apply. Amplified Sound - Please review individual picnic site or facility information, as some properties contain additional limitations or allowances. NO Miniature Trains, Water slides orPetting Zoos. OTHER AGENCY PERMITS: With park permission, and depending on the scope of your event, other citywide permits may be required. Examples include: Texas Alcoholic Beverage Commission (TABC) Permit, Building Permit (stages, structures, bleachers), Health Permit (food/beverage preparation), AFD Permits for tents (size, requirements vary). Review the advisory information above. Please make sure your reservation includes PARD permission prior to making any final arrangements of plans. The policies and procedures section of this page has information on those agencies, practices, and requirements. Metal Detecting Permits are required and typically ONLY issued to searches for a specific item lost due to extenuating circumstances. Drones – “Unmanned Aircraft”. Several regulations impact the use of drones in the park system. Common resources are listed below for convenience. Federal Aviation Administration - helpful sections, regulations, and requirements. Austin Parks - Commercial Filming/Photography Permit – required in the park system for any commercial photography or filming. Commercial use and concession permits are required and issued to applicants for training classes, exercise groups or similar commercial activity use requests (vending, merchandise sales, etc) in the park system. Concession permits are issued at stand-alone park locations where short-term or single concession needs arise that benefit an activity or the public at the requested park location. Concession permits, are NOT issued for vendors to vend outside or near permitted special events where organizers typically coordinate vendors inside their permitted grounds and spaces. Per City Code Chapter 8: COMMERCIAL ACTIVITY means to advertise or provide a good, service, class, or instructional activity for compensation. COMPENSATION means any money, thing of value, payment, reward, tip, consideration, donation, gratuity, or profit paid to, accepted by, or received by a person. APPROVAL means a permit, reservation agreement, or other written document that evidences an authorization by the department. Insurance requirements See policies and procedures section above. Commercial Use Permits Training classes, exercise groups, or similar. Temporary Concession Permits Single day or 6 month permits for food, beverage, merchandise. Bicycle tour group operators. The Austin Parks and Recreation Department (PARD) Office of Special Events (OSE) is available to assist with large scale event planning. Annually, Austin parks serve as the home for events, festivals and concerts which serve approximately 1 million attendees. PARD staff are able to assist and provide an overview and understanding the City’s requirements of logistical and behind-the-scenes planning to help ensure your event is safe, high quality, well-organized, and enjoyable for all of your guests. Large scale event planning requires careful and deliberate consideration of many details including park protection, scheduling, safety and security planning, insurance coverage, road closures, special needs access, temporary permits, transportation and shuttle services, waste management and environmental measures, and much more. Extensive advance planning is required for special events, typically beginning 12 - 6 months minimally in advance. Many events are annual, which means reoccurring. 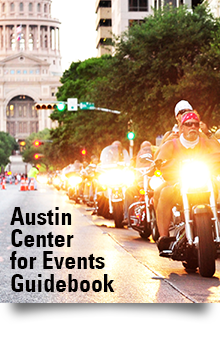 These event in Austin Parks receive standing reservations. The spring and fall seasons are typically fully booked by annual events. Special events required 6 months to 1 year advance planning and require extensive advanced development by the promoter/organizer to ensure safe, and sufficient plans are procured to sustain the event. Typical Special Event Requirements are substantial, and require extensive planning, budgeting and preparation with the expectation for the highest quality planning put into an event by the organizer. An extensive library is available to aid in assessing capacity and planning. See the complete policies and procedures section for information on a variety of permitting topics. Typical Event Checklist - Shows the range of anticipated items requiring planning. Insurance - Insurance - Standard requirements for all public events, & possible coverages as required by the park system. The combined Austin Center for Events resource material for review can be found at: www.AustinTexas.gov/CityStage, see the “Event Planning” section.